Time for an early review. This will be the only time today I will have access to a PC and an internet connection…I know…hard to believe in this day and age. So lets get to the beer. 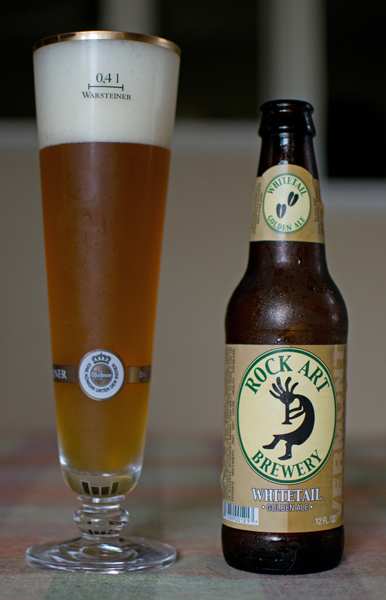 Beer #217 is Whitetail Golden Ale by Rock Art Brewery from Morrisville, Vermont. The ABV on this American Blonde Ale is 5%. I love the label on this, it depicts Kokopelli, the deity of fertility in some Native Ameican cultures. It reminds me of my trip many years ago to Sedona, Arizona where I remember seeing the image of Kokopelli quite often. Awesome place, awesome trip…I love Arizona. I just love that Warsteiner glass this went in to. That particular glass seems to accentuate the head, just look at that huge white foamy head sitting atop that golden colored brew. The nose was very grainy with wheat aromas. There was also a touch of yeast bread like aromas. The taste was pretty much grains and wheat with just a touch of lemon at the back end. It was a crisp, light bodied brew with light carbonation. I’m not a big fan of American Blonde Ales and this does nothing to win me over. I could see this being enjoyed on a hot summer day though as it is light and would probably be thirst quenching. For that and Kokopelli, I will give it a slight bump from something to give to the Peasants to a drink suitable for Jesters. TGIF!!! And boy do I need it this week. Also it is the start of Interleague play, MLB style. What does that mean…well it means the 2011 version of the Subway Series, Yankees vs. the cross town stinkers…also known as the Mets. 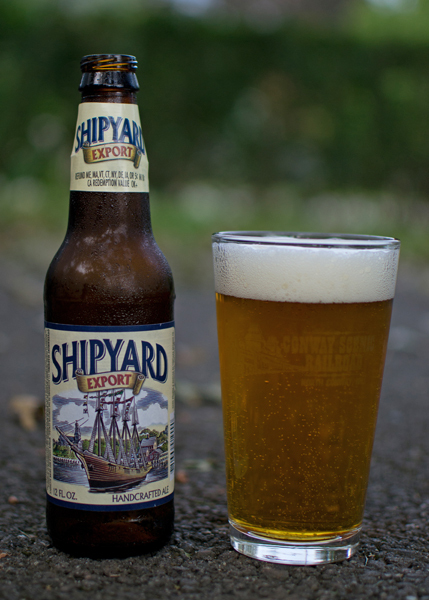 To celebrate I figured a nice “Summer Ale” for beer #173. 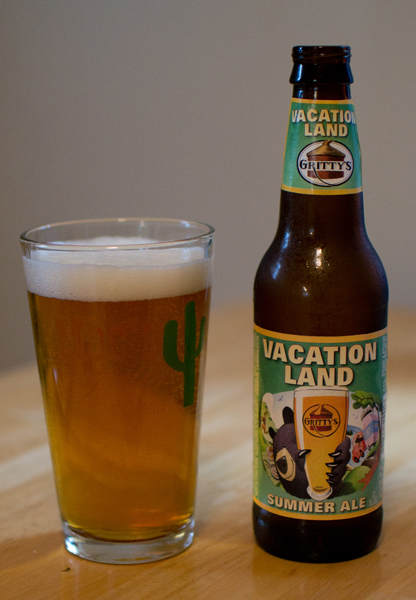 Vacationland Summer Ale by Gritty McDuff’s Brewing Company from Portland, Maine is an American Blond Ale with an ABV of 4.9%. I broke out my Mac’s Grill pint glass that my mom “borrowed” from their establishment in Auburn, Maine many many moons ago. Into to it went this light amber liquid. It had a creamy white head (that creaminess comes through in the tasting too) of about one finger width in size. It had a nose of grains, a very bread like aroma. Throw in some grass like smells and you pretty much have the nose. It had a sort of sweet malty taste up front with a bit of wheat that finally finishes up with some slightly bitter citrus similar to lemon. The body was somewhere between medium and light with the carbonation on the lower side. It was very easy to drink this brew while listening to the ballgame streaming through the old internet. Not too shabby. 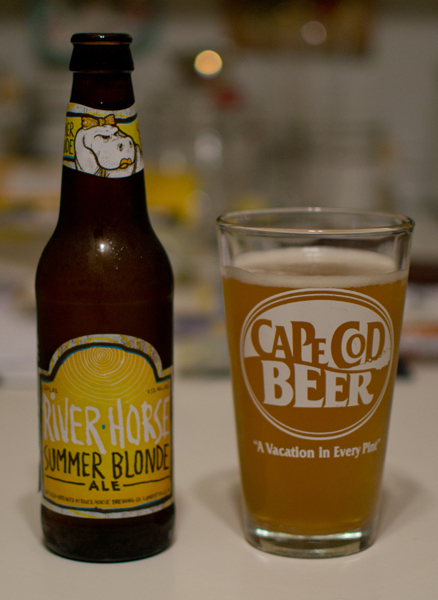 I liked this and felt that the hoppy lemon flavors give it that summer feel. I could see myself enjoying this out on the old back deck on a hot summer day listening to the Yanks. Let go Yankees!! !